The summer can be a tricky time for business. Your best prospects are on vacation, and leads may seem a little harder to come by. You’re probably even more inclined to spend a free moment at the pool rather than refining your digital marketing practices. But let’s face it: if you slow down on lead generation now, you’ll be paying for it months down the road. 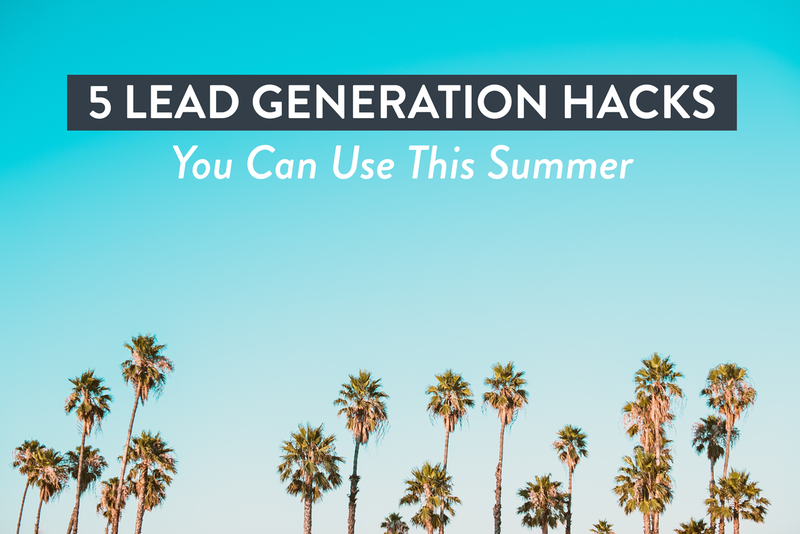 That’s why we’ve compiled the following list of five lead generation hacks to use this summer. They’re straightforward enough that even the most unmotivated marketers can see a little more ROI without having to put forth a ton of effort (or expend a lot of budget). Lead Generation Hack #1: Tweak your homepage into more of a landing page. If you’re like most businesses, your homepage gets the vast majority of your total site traffic. But traffic alone doesn’t equate to sales – you need to convert these anonymous site visitors into leads that you can market to, again and again. The trick is to treat your homepage as a landing page. Limit the options site visitors have when landing on your main page, in order to drive them toward offering up their coveted contact info. Populate your home page with essential keywords about your core offerings. And most importantly, place a clear and irresistable call to action above the fold that aligns with your core messaging. For example, if you’re a graphic design firm that boasts quick and beautiful custom graphics, offer (in exchange for a name and email address) your homepage visitors a free course in basic design, a PDF about design secrets, or an eBook “ultimate guide” to basic design. Lead Generation Hack #2: Do one really awesome webinar. Webinars are all the rage (especially for B2B), and it’s no wonder: 20-40 percent of webinar attendees are likely to become qualified leads, according to this ReadyTalk survey. You probably already know that giving something valuable away for free is a fantastic way to capture leads, so now it’s just a matter of doing it! Keep your webinar short, simple, and focused on one thing. Your prospects will appreciate you for considering their time, and keeping the webinar focused on one subject will ensure you’re really providing something helpful rather than a broad overview that they could’ve found with a Google search. One thing to keep in mind: nothing turns attendees off faster than a dull speaker, so get excited about your topic and make sure it shows in the way you present your material. Lead Generation Hack #3: Automate it. Use a chatbot tool to create custom messages that appear when your site visitors are on different pages. The key word here is “custom”: if you’re sending the same broad offer to all of your site visitors, you probably won’t see a big jump in qualified leads. But if you extend offers that are relevant to the content your visitor is already exploring, you’re almost guaranteed to see a significant increase in prospects. Plus, once you’ve programmed your chatbot, you don’t have to lift a finger. How’s that for lazy summer lead generation? Lead Generation Hack #4: Tweak your forms. They’re short and relevant. Avoid using more than four or five fields, and include only what’s absolutely necessary. In many cases, this may only be a name and email address. Imagine the user’s perspective. Little details like inline error notifications (for instance, “include your area code” in the phone number field) or using radio buttons instead of drop-down menus can make things easier on your prospects and increase their likelihood of completing your forms. Provide “required” and “optional” fields. This is a good tactic to potentially capture more data about customers who are willing to provide additional info — without estranging those who prefer to only offer a name and email. Test some of these changes on your site’s forms and see if they make a difference. Lead Generation Hack #5: Use an exit popup to grow your email list. We can all agree that popups can be overwhelming and annoying at times. You don’t want a popup in your face when you’ve just arrived on a site for the first time and have no idea whether the content you’re about to read is valuable or not. That’s why it may be wise to test an exit popup that’s triggered when a user mouses up to close a tab in their browser. These can feel less intrusive than banners or popups that appear a few seconds into a user’s experience on your site, but still have all of the potential to capture an email address that you can now use in your remarketing. Most importantly, focus your lead generation efforts on one or two strategies at a time. If you spread yourself too thin you’re unlikely to see results – but if you keep focused on one thing and hone it to perfection, you can build up from there.